Welcome summer! Love those weekend highs. Today, the Legend coupe went in for an oil change and I added yet another page to the 2-volume set of maintenance records that date back to 1994. The oil had last been changed on February 14th at 519,701 miles, so it’s definitely taken me awhile to rack up nearly 3,000 miles on this one. For $43.78, I was out the door with fresh 5W30 oil and a new filter. It’s worth noting here that I’ve never topped off the car’s oil level between changes. I’ve checked the oil level mid-change and it’s always been within allowable limits. 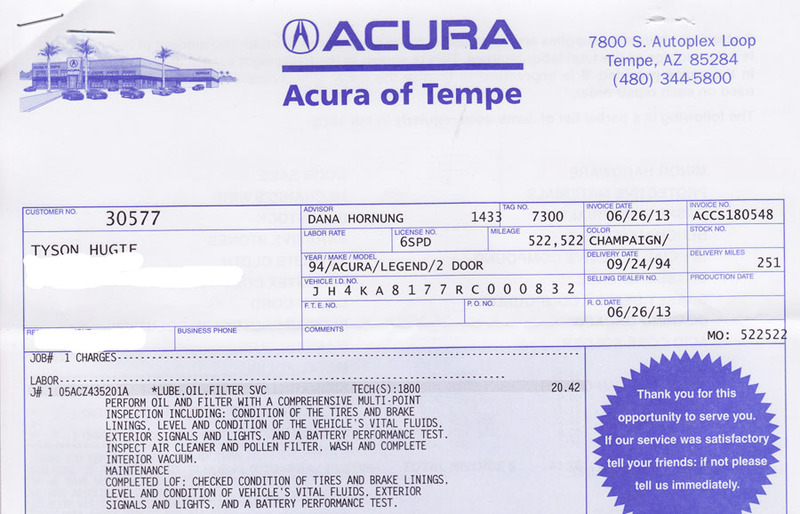 The mechanic did make mention on my paperwork of some leaks that I may need to address before my big trip to North Carolina later this year for the National Acura Legend Meet. Namely, the power steering rack and the differential (both of which are original to the car). 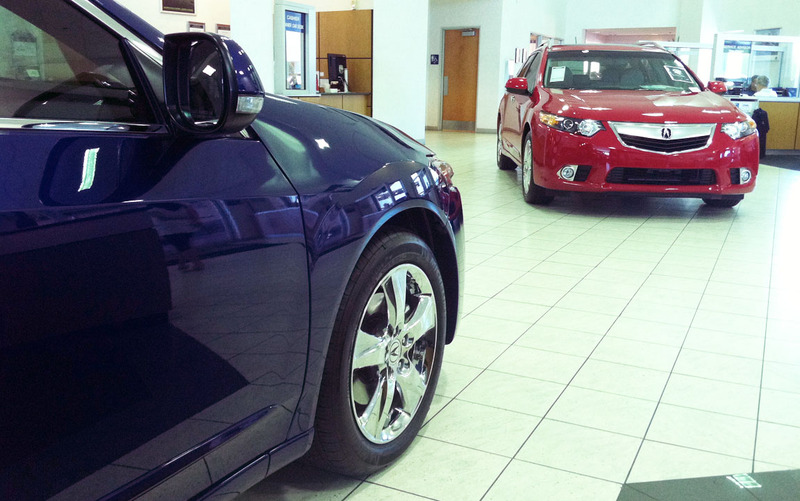 Acura of Tempe, Arizona must be feeling patriotic, because they had this Vortex Blue TSX Sedan and Milano Red TSX Wagon parked at the entrance to the service department. They just need to park a white one in between them! While waiting for the service, I had time to check out the all-new MDX that went on sale recently. Those signature “Jewel Eye” headlights that we’ve also seen in the new RLX are appearing here as well. 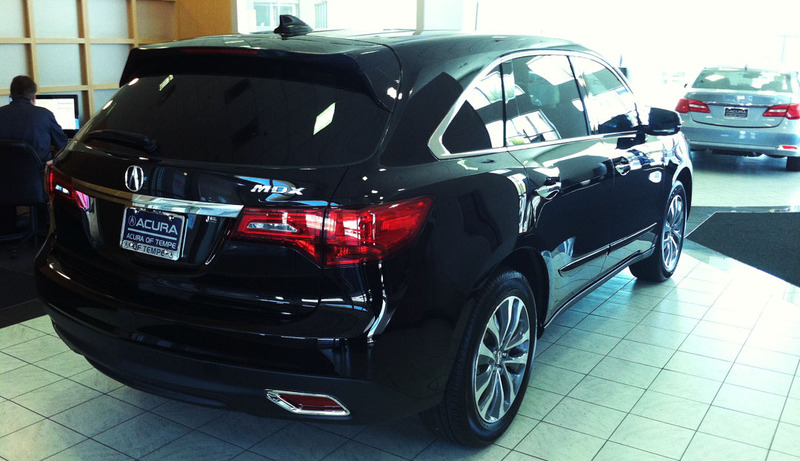 The MDX is powered by a 290-horsepower 3.5 liter V6 that delivers impressive fuel economy at 28 mpg highway. That seems really great for an SUV of this size and weight. Remember, this thing has a third seating row for passengers and can accommodate 7 comfortably! The interior appears to be nicely appointed, too. 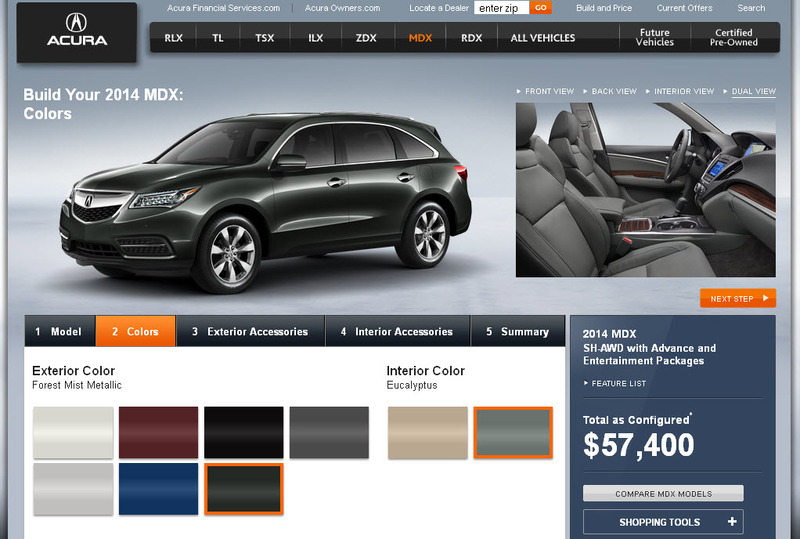 Apparently, this latest Acura MDX – when equipped with some of the higher end Technology or Advance packages – can be outfitted in Forest Mist Metallic with Eucalyptus (green!) leather interior. Next week’s Independence Day holiday will mean extensive travels for the ILX, but it won’t be going too far this weekend. I found a lot of random stuff to share over the last several days. First, some NEW Acura news. Brenda Priddy Spy Photography caught the 2015 Acura TLX out for hot-weather testing in Death Valley. This car will reportedly be the successor to the current TL. Temple of VTEC has a photo album here. Can’t wait to see more about this exciting new model. 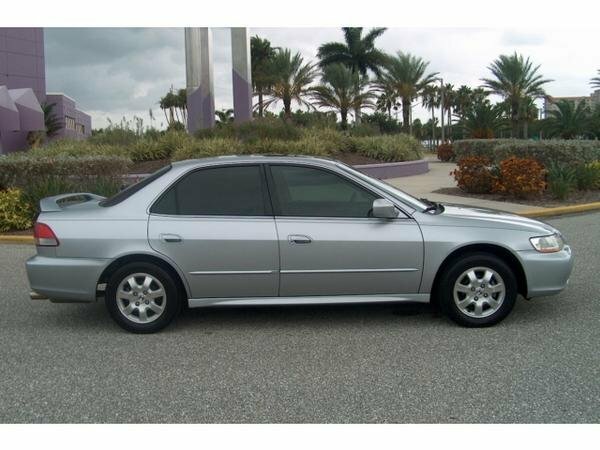 My friend William has a 2000 Honda Accord sedan 5-speed that he and his family have driven since brand new. 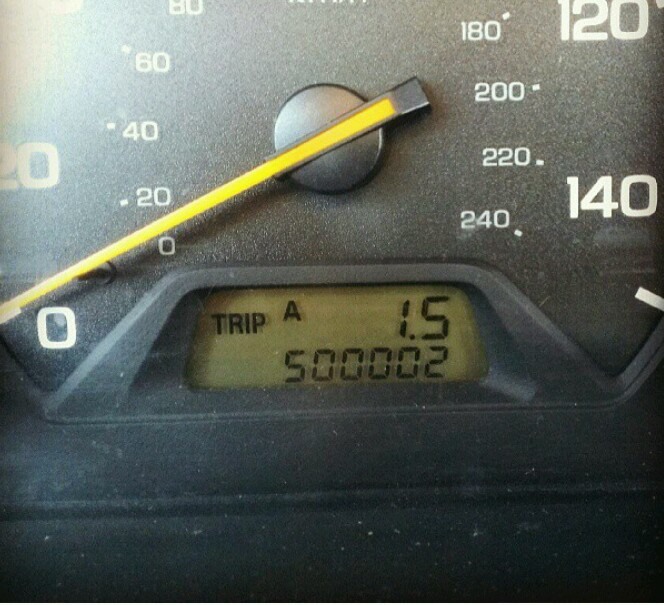 It rolled 500,000 miles a few days ago outside the base where he’s stationed in Georgia. 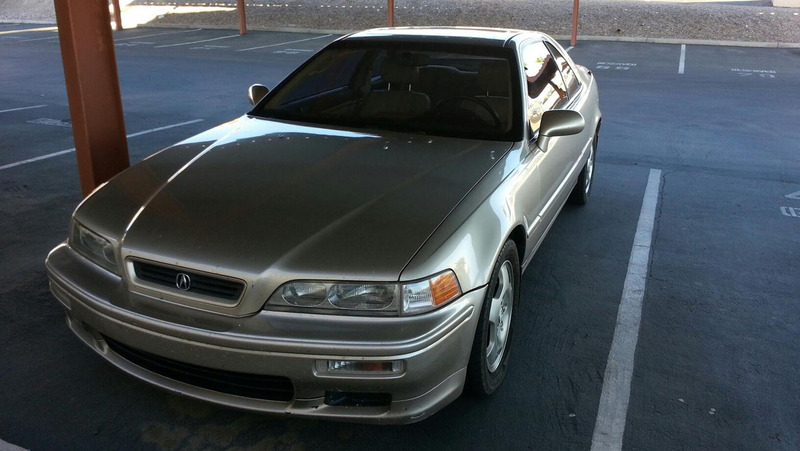 And my friend Spencer also hit a milestone in his Cashmere Silver Metallic 1994 Legend LS coupe 6-speed. Notice how he managed to get 234,567.0 on the odometer with 901.2 on the trip meter. Clever thinking (and some pre-planning) there! Spencer’s car looks great for its age and mileage! 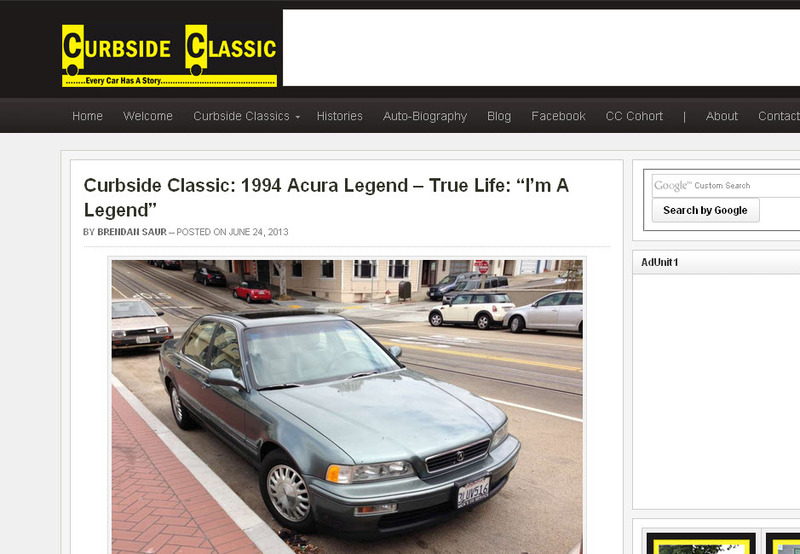 Check out this write-up by Brendan Saur of Curbside Classics which is a nice discussion about the evolution of the Legend and its successors. Brendan did a great job of capturing the highlights of Acura’s flagship, from the original 1986 Legend to today’s 2014 RLX. If you’ve got 7 minutes to spare, this YouTube video is a fun 1995 comparo between the then-new 1995 Nissan Maxima and some other luxury competitors, including the Acura Legend LS. Link here since it won’t let me embed. My favorite comment was during the acceleration test when the narrator claimed the Maxima had better performance because it “powered ahead of the Lexus, the Mercedes, and the Legend.” Notice that he didn’t say “the Acura.” This exact point is why Acura abandoned the Legend nameplate in favor of the alphanumeric “RL” name. 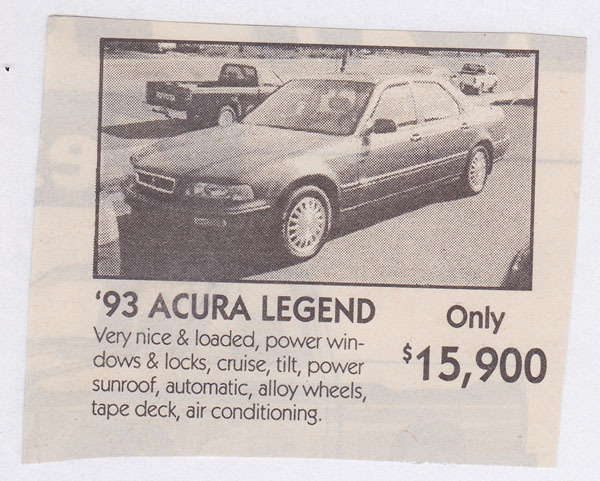 People were associating the car with the name “Legend” more than with the name Acura. 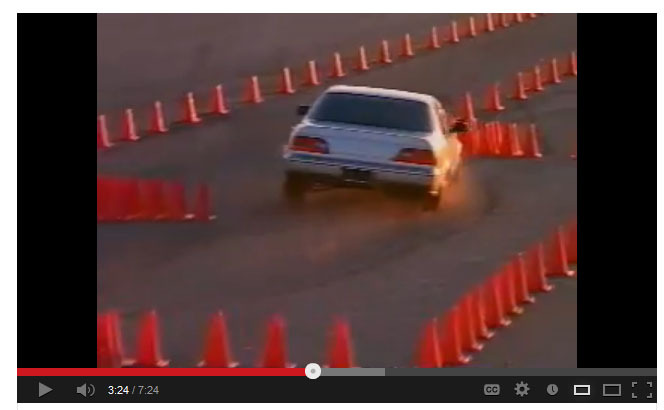 Look how they throw the car around those cones at 3:24! And yet another throwback: This is a scan from my high school yearbook (year 2000). 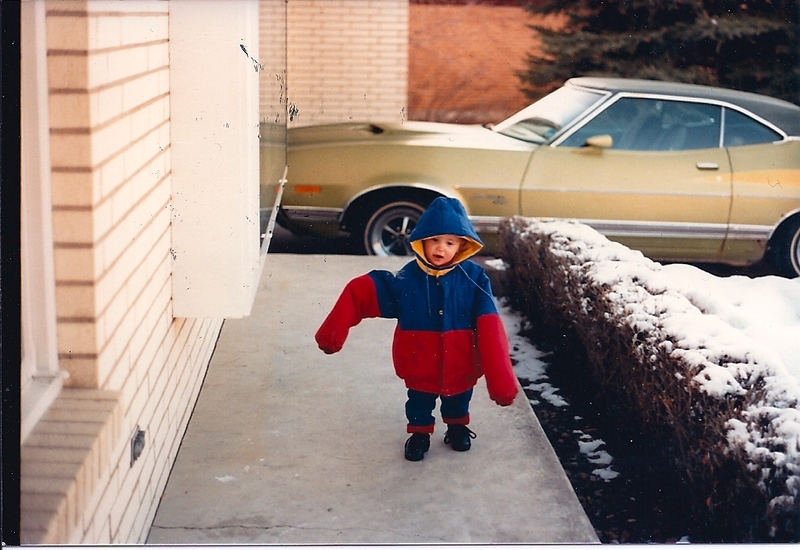 Even back then, I took a great deal of pride in my car, a 1989 Honda Prelude Si. In fact, I made sure to get the exact same parking space every day – right along the street where I could keep a close eye on the car AND have it be protected from receiving dents from careless fellow classmates. 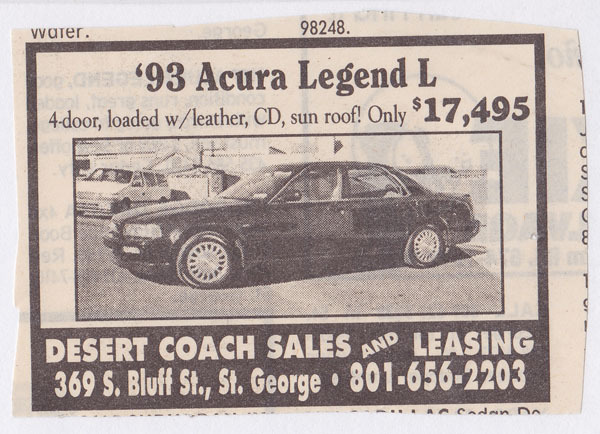 Around that same timeframe was when my family had a 1993 Legend L sedan. I must’ve been keeping an eye on classifieds because for some reason I clipped these two out of the Pioneer Shopper that came out every Thursday! It seems odd to see such a pricetag on a 1993. It’s also hard to believe these clippings are from 15 years ago. Sure wish I could get $17,500 out of my 1994 today! This entry was posted on June 26, 2013 at 7:01 pm and is filed under Legend, Maintenance. You can follow any responses to this entry through the RSS 2.0 feed. You can leave a response, or trackback from your own site. The “throwback” blog! Nicely done. Glad to hear the ‘ole 500k gal is getting some attention. Get her all dolled up before the big NALM meet. I know you, and you wouldn’t want to take her out on the big date if she wasn’t looking and feeling her best! Dave, you’re absolutely right. NALM is a 4,000+ mile journey so I will make sure things are good to go before departure. Typically, I “over” plan things like that. When NALM was in New Jersey in 2011, I took not one but TWO full-size spare tires. The coupe better show up at NALM in all of its glory! We have a date to sign my trunk lid and who knows, maybe I’ll kiss your signed dash! What a photo that will make! You bring the silver Sharpie and the magic is bound to happen. Photo opportunities will abound. Look forward to it! 1) What is the highest outside temperature reading you have gotten in your ILX? 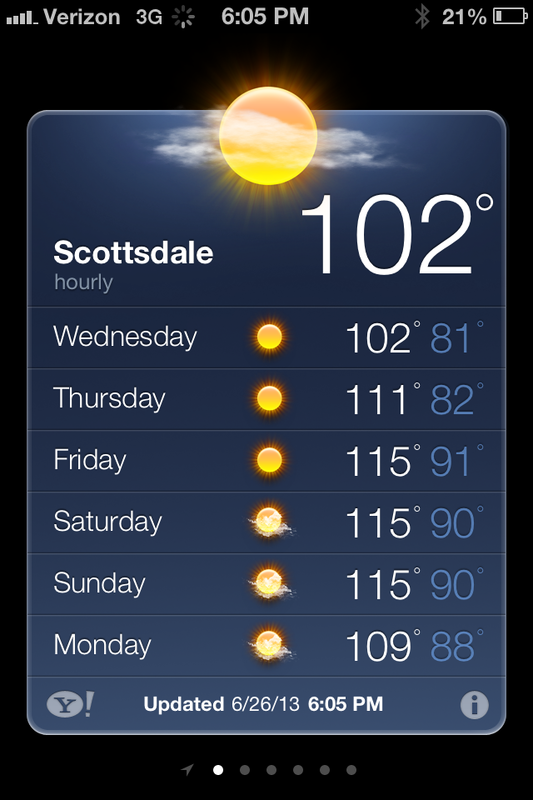 I heard about the heat wave in the western part of the country. You might break your all time record high reading. 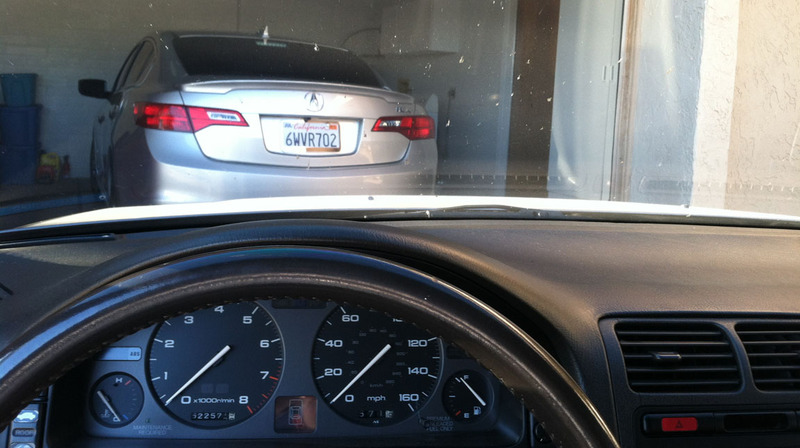 2) Do you change the oil in your Legend more frequently than in your ILX? I believe I read in the past that you change it every 3000 miles in the Legend and every 5000 miles in the ILX. Is this because the ILX is newer and the engine requires less frequent oil changes? With my 2005 Acura TSX, I usually change it every 5000 miles. I follow the severe schedule since I do a lot of city driving. The TSX owner’s manual itself makes mention of either 5000 miles for severe schedule or 10,000 miles for regular driving. Do you know if your Legend original Owner’s manual ever made a 3000 mile oil change recommendation for severe driving? 2) I’m going to put together a completely separate blog entry about oil change interval since it’s a hotly debated topic, but I change the oil in the Legend every 3,000 miles (5W30) and the ILX every 5,000 miles (0W20). Severe driving recommendation is 3,750 on the Legend. 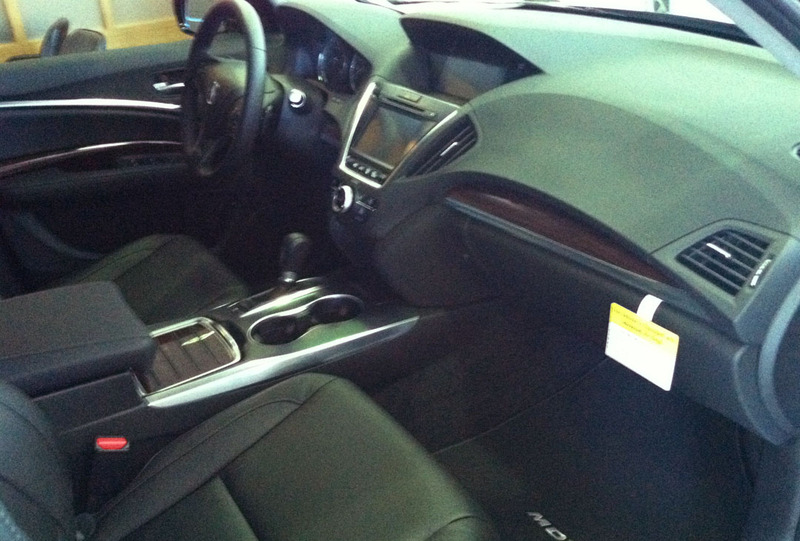 On the ILX, there’s no mention of mileage anywhere in the manual. Instead, it instructs the owner to rely exclusively on the “Maintenance Minder” display that has a % oil life remaining. Tyson, nice “throwback” post! That Legend continues to amaze me. I think the saying, “they don’t make ’em like that anymore” certainly applies here. Many newer models probably can go 500K, but not on a chassis with as many original parts as yours. I already have new axles on the Accord at 100k. Normal wear I hear. Those “jewel eye” lights on the MDX and RLX sure catch my attention. I’d like to see more of that used in the rest of the Acura lineup. Jason, I’m betting we’ll see those Jewel Eye headlights trickling down to just about every model in the lineup. It seems to be becoming a signature feature, much like the “shield” grille. I still can’t believe your 10-day, 4,000+ mile road trip recently – inspirational is the word that comes to mine. I’ll keep tabs on your blog for updates. 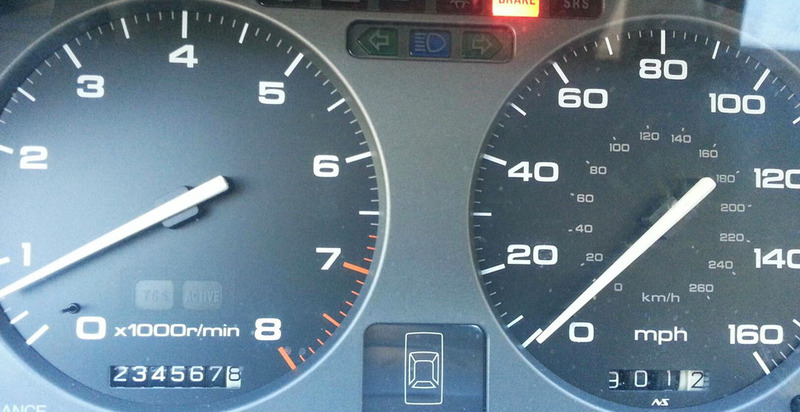 It is phenomenal that a car almost 20 years old and with more than 500,000 miles does not burn oil between changes. And you are running the thinnest conventional oil of 5W30 unlike 10W30 or 20W50 or the other ones that have just one number like 30 or 40 which burn at a lesser rate since they are thicker. Incredible.